Self storage units help millions of people all over the world declutter their lives and securely store their valuables. Households and business owners alike use self storage units to get seasonal decorations and clothing out of the way, keep that summer vehicle safe and sound during winter, and store things such as family heirlooms and business inventory. If you have a storage unit, you know how important it is to keep it organized, so that it doesn’t become a chore just to get in and out when you need to. 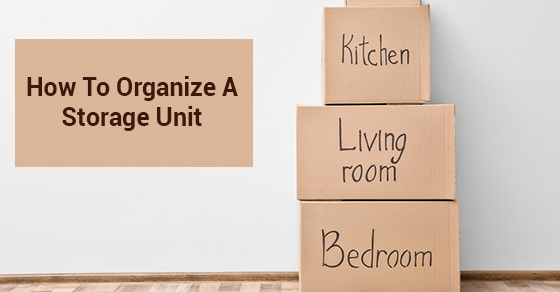 Below are four tips for organizing your storage unit. When you put all of your stored items in boxes of the same size, it makes them much easier to stack. Solid, balanced stacks are easy to organize, so you can ensure that you always have access to all four corners of your storage unit. That being said, it still pays to practice good stacking and storing techniques, such as not stacking heavy boxes on top of lighter ones, or ones that have fragile items in them. Many people are so excited to free up space in their home or their office that they forget that they will need to access the items being stored at some point in the future. When they finally go to take the items out, they realize that they have put those items in an inaccessible corner of the unit. Identify the items that you think you might need in the short-to-medium term, and either keep a clear path in the unit so you can access them, or place them as near to the front of the self storage unit as possible. A storage unit can make your life easier, but only if you let it. One of the most important things you can do any time you are storing items is to label the boxes you place them in. If you place items haphazardly into boxes and then simply stuff them away into your self storage unit, in 3 months, 4 months, or a year’s time are you going to remember what, exactly, you put into each box? Probably not. It is always wise to map out your unit before you pack it, or at the very least, after you have packed it. This will cut down on the amount of time you have to spend rummaging around for things when you inevitably need to take them out. This, combined with the aforementioned labelling of your boxes, is a surefire way to build a well organized, easy-to-use storage unit. A self storage unit can make a world of difference in your life. Once you’ve filled it with things you want out of your way, you will be amazed at just how much space has been freed up in your home or office for the things that really matter. Keep the above tips in mind when organizing your storage unit and get as much out of your extra space as possible.